I can hardly stand it! It’s finally time to kick off our third annual holiday series…. The 12 Cakes of Christmas!! Over the next month, we’ll be oohing and aahing over twelve marvelous cake designs, created especially for this series! All brand new, never seen before, and created by some of your favorite bakers! For our theme this year, we’re taking a moment to reflect on our favorite Christmas memories and traditions. As the month of December rolls on, our days often become saturated with to-do lists and holiday tasks. The merriest time of year becomes the craziest time of year! So throughout the hustle and the bustle, I hope you’ll check in and let us provide you a little refuge from the holiday mayhem. 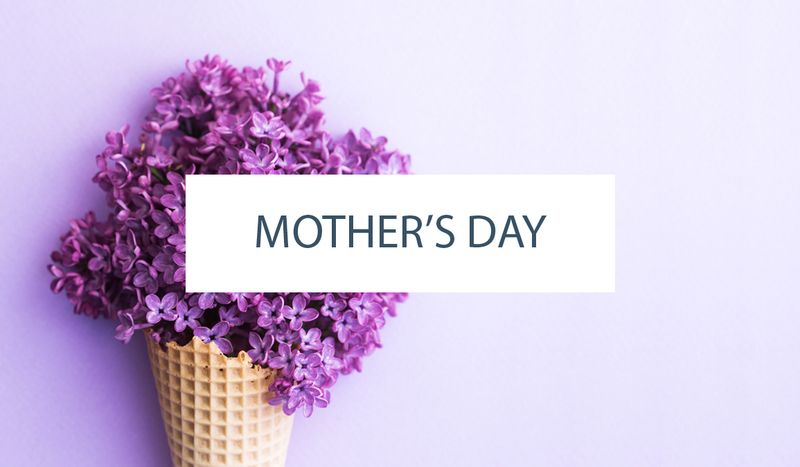 Because here on the blog, we will be celebrating the little things that make this season shine bright. Each of our featured bakers was asked to create a cake based on a classic Christmas tradition. So let’s get started! Our first cake celebrates one of the most recognizable symbols of the holiday season. A twist of red and white peppermint that’s sticky sweet and smells like Christmas. The First Cake of Christmas was inspired by …. candy canes! The first cake in our series comes to us from Allison Kelleher, owner of AK Cake Design in Portland. Allison has been with us from the beginning of this holiday series, stealing our hearts with her snowy white cake back in 2011 and her incredible metallic ornament cake in 2012. You loved Allison’s cakes so much that we happily invited her to join our talented list of blog contributors this year. You probably remember her watercolor cake tutorial – it was nothing short of amazing! Well, Allison’s refined sense of style and love of patterns has come together in a graphic cake fit for 2013. 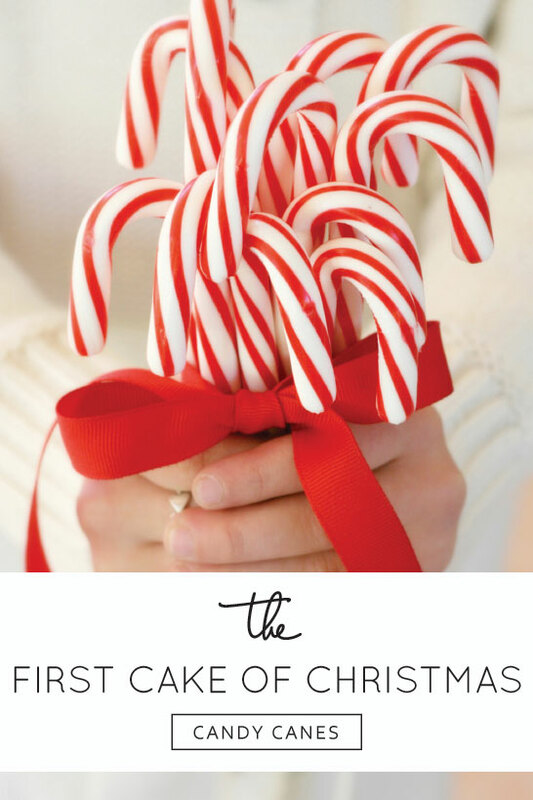 With meticulous detail and a velvety touch, Allison is taking candy canes to the next level. It’s time for The 1st Cake of Christmas! 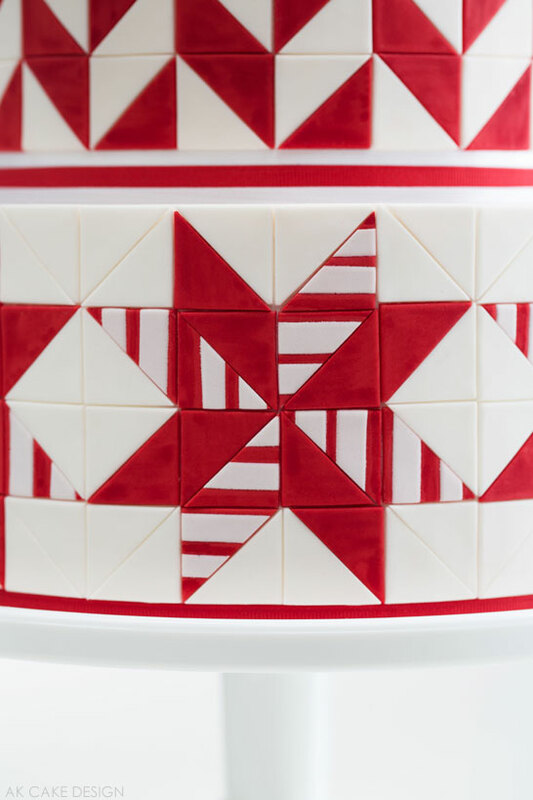 “For my top two tiers, I used a quilted herringbone motif reminiscent of those mysteriously disappearing candy canes. 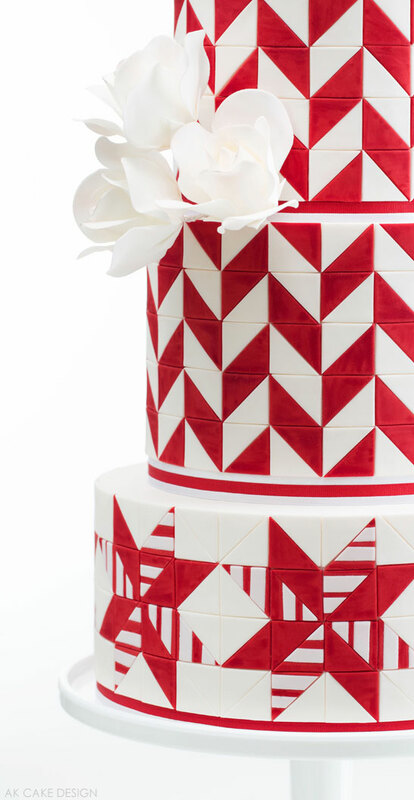 The red fondant triangles are hand-painted with red petal dust and lemon extract to give a velvety appearance. For my bottom tier, I created a snowflake quilt design. It’s true. . . I have a fondness for quilt patterns. Hand-made quilts remind me of warmth, coziness, and family – my own quilt was made by my aunt and given to us on our wedding day. 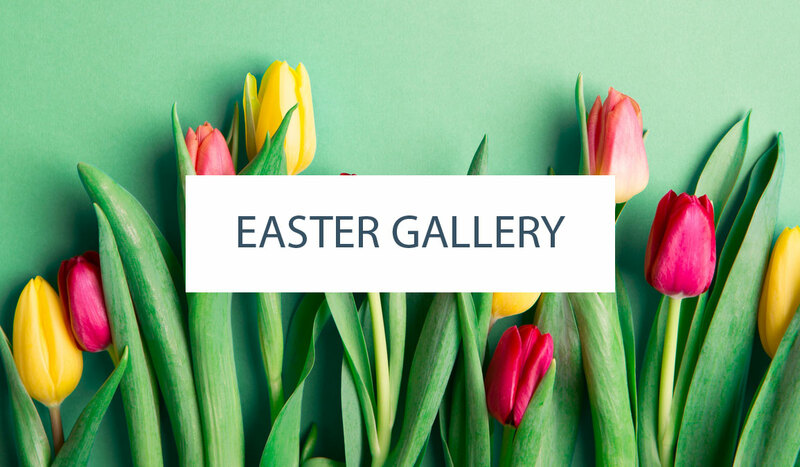 From a design perspective, I tied the two themes together using two elements – pattern and color. While the candy cane theme is created with a quilt pattern, the quilt theme is dressed in ‘candy cane’ red and white. For the finishing touch, a cluster of white sugar roses balances the design-heavy top of the cake with the whiter bottom tier. Absolutely mesmerizing! I could get lost in the precision and placement of each individual triangle. 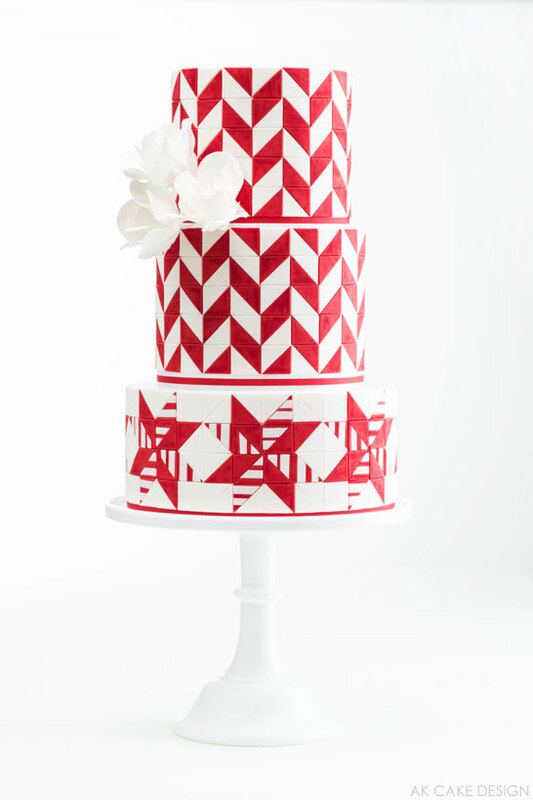 Thank you to Allison of AK Cake Design for inspiring us with her stunning candy cane design. And to Lara Ferroni for the incredibly beautiful photography! Up tomorrow… The 2nd Cake of Christmas! Stay tuned! In the meantime, be sure to enter our mega KitchenAid Mixer Giveaway! One lucky reader will win a top of the line, 7 quart KitchenAid! Enter to win here!! Amazing detail. A simply stunning cake! Gorgeous as it always is with AK Cake Design. Absolutely beautiful and such a great cake to kick off the 12 cakes of Christmas with. I love this cake series! And this design is simply breathtaking. Congrats to the baker! Beautifully done! You achieved your intent of a candy cane theme, with great success!! I must say, I was expecting something a little more… Literal!? But I couldn’t be happier with the design that came out of the AK Cake Designs kitchen! So much more interesting and inspiring! This is STUNNING! I’ve never seen a quilted cake before, beautifully done, thanks for sharing! Thank you Carrie, and thank you all for your very sweet words! Me encanto!!! Muy original creativo y totalmente navideño. Toda una obra de arte! Felicitaciones!